Arthritis of the shoulder is surprisingly common. It describes the painful condition whereby the articular cartilage of the joint degrades, fragments, and then disappears leaving the joint to articulate bone on bone. This encourages the body to generate new bone (osteophytes) and cysts appear on the xray. It usually occurs in older people but sometimes we see it in people as young as 40. Genetics. This is one of the commonest causes in older people. Often arthritis will have been noticed in other joints and many people will already have had a hip or knee replacement before their shoulder arthritis gets bad. This is called primary osteoarthritis. It often runs in families down the maternal line. Rotator cuff tear arthropathy. If the tendons of the rotator cuff have been badly torn for a prolonged period then secondary arthritis can develop. After trauma. If there has been a major injury to the shoulder, especially a fracture within the joint, then this can precipitate arthritis. After instability. Anyone who has had numerous shoulder dislocations will be prone to developing arthritis at a later stage. After infection. This is quite uncommon in the UK but some bad infections can lead to later arthritis. Inflammatory arthritis. Used to be seen commonly in people with rheumatoid arthritis but massive improvements in drug therapies has made this much less common. Avascular necrosis. This is another uncommon condition whereby the head of the shoulder dies off because it loses its blood supply. It may happen in heavy alcohol users, steroid abusers and people who have worked deep underground or sometimes it just happens without a clear risk factor (idiopathic). The commonest complaint of shoulder arthritis is pain. When the arthritis is very bad then the pain can be constant and unrelenting. It might cause considerable night pain. The shoulder also becomes stiff and it will be noticeable that both reaching up high and reaching up the back becomes very limited. Other symptoms can include grinding, cracking, creaking and locking. Everyone will need an xray and this often demonstrates the diagnosis adequately. Sometimes it is necessary to visualise the rotator cuff tendons and this might be done with an MRI or an ultrasound scan. 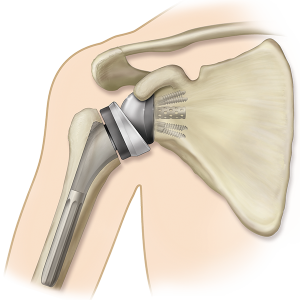 For closer detail of the bones then a CT is often helpful and is frequently used for the final planning of a shoulder replacement. This always starts with gaining an understanding of the underlying problem. Thereafter the simple things to try are activity modification (eg bringing things down off high shelves to lower places, front fastening bras, changing sleeping position), regular painkiller tablets and anti-inflammatory gels. There is evidence that chondroitin sulphate and glucosamines tablets help some people. Cartilage scientists believe that fish oils should help although there is no clinical proof for this yet. Some people find physiotherapy helpful particularly if the rotator cuff is weak. Gentle swimming can aid stretching and strengthening the shoulder. Many people will know somebody who has had a hip or knee replacement but some are surprised to hear that shoulders too can be replaced. In fact it is an operation that has been around for many years. Currently the success rate of shoulder replacement is about as good as knee replacement; that is, it should hopefully last for at least 10 years before it wears out and may need revising. The shoulder replacement never feels completely normal but is usually very good at relieving pain, often improves movement, and usually improves function. 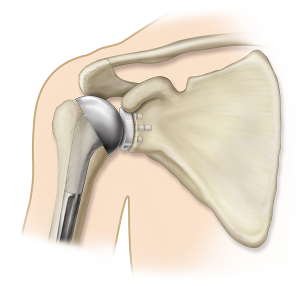 There are a number of different types of shoulder replacements. It is not yet entirely clear whether one type is better than another in any particular situation but most surgeons have a feel for what they believe to work best. In essence, the standard procedure, in Harry’s practice, is to perform an anatomic total shoulder replacement. If the rotator cuff is badly torn or not working then a reverse total shoulder replacement is required. In other less common circumstances, a resurfacing or even a stemmed hemiarthroplasty might be preferred. The final decision depends on a host of factors and will be discussed before surgery. The operation is performed under general anaesthetic (fully asleep). It takes about 60-90 minutes.You will be in a sling for some weeks after the operation although you will be allowed to do gentle things with your hand immediately. To read more about the operation click here. As with all operations there are potential risks and complications which must be carefully considered before embarking on this major surgery. Loosening and wear. This is inevitable. No shoulder replacement will last forever. The average life expectancy of a shoulder replacement is about 10 years. When it wears out it may start to become painful. At that stage the only solution might be revision shoulder replacement. The revision is a more complex operation with higher complication rates and lower success rates than the first replacement. Therefore the younger you are when you have a shoulder replacement the more likely it will require revision surgery with higher risks. Infection. As with all major joint replacements the risk of deep infection is less than 2%. If and when it happens it can be devastating. It may require multiple further operations and prolonged period of antibiotics and a much less good outcome than if there is no infection. Nerve injury. Sometimes the nerves around the shoulder can become stretched or even cut. In the worst case scenario this could leave your arm or hand permanently paralysed. This is rare. Dislocation. 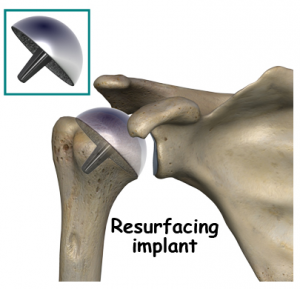 The shoulder joint replacement can dislocate. You will be shown how to avoid this complication. If it becomes a recurrent problem then it may need further surgery to rectify. Fracture. It is possible to cause a bone to fracture (break) during insertion of the joint replacement. Usually this would be recognised at the time of surgery and would be addressed immediately. DVT/PE. Blood clots in the leg (DVT) can break off and circulate to the heart and lungs (PE) where they can rarely be fatal. Thankfully this is rare. Despite this very scary list a shoulder replacement, for most people, is not associated with any complication and typically you would expect to be almost pain free and functioning well within 3 months of surgery. After that you would hope to expect 10 years of good, pain free function. The vast majority of patients are delighted with the outcome and most wish they had had it done sooner! You can download the postoperative physiotherapy protocols for anatomic total shoulder replacement, reverse total shoulder replacement and resurfacing hemiarthroplasty. Harry has performed 445 shoulder replacements.